Redefine your living room decor by using these Rose Bloom potted artificial flowers from the house of Ivy. Crafted using premium quality material, they come with a classy finish. In addition, they resemble the look which will add a touch of natural freshness to any interior setting. 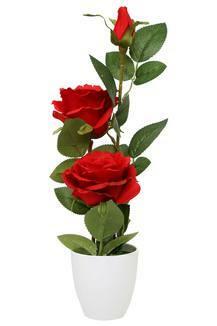 Let your room reflect your classy choice by opting for this Rose Bloom Potted Artificial Flowers decor.